What's the deal with Bare Escentuals mineral makeup? What is mineral makeup, anyway? If you've found this webpage, you're probably curious about both of the above questions. Let's start with the latter. Mineral makeup usually refers to a loose powder with a mineral base, such as mica, titanium dioxide or zinc oxide. The most popular form of mineral makeup is the finely ground loose powders which are buffed into the skin using a brush. 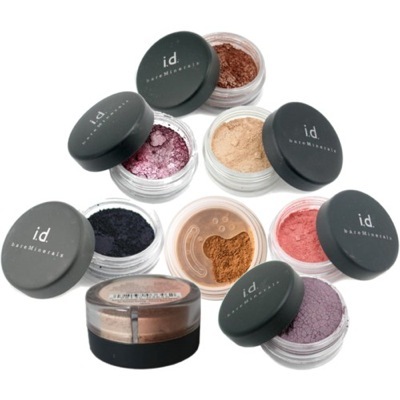 These loose powders come in foundations, eyeshadows, blushes and other types. Mineral makeup is something of a buzzword, since most makeup has some minerals in it, and there is no standard for the label, just as there is no standard for "hypoallergenic" or "natural." Plus, minerals have been the base for many makeup products for decades; there's no scientific proof they're "purer" than others. Caveat emptor! Bare Escentuals is a mineral makeup company, now owned by Japanese cosmetics giant Shiseido. They sell foundations, makeup primers, eyeshadows, lip glosses and mascaras. Bare Escentuals and Sheer Cover are currently in a ding-dong battle to be the "best mineral makeup brand." Which one is better? Depends whom you ask. Bare Escentuals mineral makeup is very light, making it a favorite for people who don't wear a lot of makeup, or dislike heavy makeup's feel on their skin. The downside is that, because it's so light, it does not hide any serious skin issues, such as acne, scarring, blemishes or birthmarks. If these are not a problem for you, you might consider using it. Their mineral foundations feature SPF 15. This is not sufficient skincare protection, making one wonder why they put it on since you have to put on sunblock under it, anyways. However, some people would not wear any SPF if they didn't include it. Some Bare Escentuals products contain Bismuth Oxychloride, which can cause a mild allergic reaction, increased oil on the skin and increased acne for some people. If you have very oily skin, avoid this one! I personally have had good experiences with Bare Escentuals foundations. It matches my skin tone, lasts a long time and doesn't feel heavy at all. I always use a makeup primer underneath it, though, which might prevent me from breaking out. I also have very light skin, so perhaps I am the target market. It is hard to know, in a store, whether a certain foundation is right for you. Assuming the color matches, how do you know whether it will be long-lasting, or cause adverse reactions? If you're curious, the Try It Kit is only $37 and features many different samples of Bare Escentuals mineral makeup, as well as a makeup brush. Mineral makeup companies may tell you that you need some kind of special "mineral makeup brush." Don't believe it. However, once you get past the marketing hype some of these brushes are high quality. But there's no reason why MAC brushes, for example, couldn't work. Return to Enjoy Your Style's brands section.